XTB.com is a European based forex and CFD brokerage that has been in operation since 2002. Regulated by the International Financial Services Commission (IFSC) in Belize under License No: IFSC/60/413/TS/17 this brokerage has provided a generous variety of investable assets varying from indices, commodities, stocks, ETFs and cryptocurrencies. Considered to be a veteran amongst the online investing community, XTB has shown how providing a reliable and innovative investment destination has enabled their platform to flourish despite their length of operation. As you will gather, XTB provides an enhanced user-investment experience while offering a broad range of incentives to enroll in. Having their platform empowered by the xStation 5 and MetaTrader4 charting solution has enabled this brokerage to tailor their platform to traders across varying industries. While some complaints regarding the lack of friendliness among their customer support staff has been reported, it still appears that XTB is a viable brokerage for forex, CFD and cryptocurrency traders. XTB is one of the most prominent stock exchange-listed forex and CFD brokerages. Possessing a number of offices across 13 countries such as Belize, UK, Poland, Turkey, France and Germany has enabled this brokerage to expand their trading platform to establish global reign as a leading forex, CFD and cryptocurrency trading destination. XTB.com is owned and operated by a company known as XTB International Limited. A corporate search at the Belize Companies Registry will confirm that XTB International Limited is indeed an active corporation under registration number 153939. According the Contact Us page XTB International is headquartered at 35 Barrack Road, 3rd Floor, Belize City, Belize, C.A. In addition to offering live chat support the email address [email protected] is provided along with the telephone number +44 2036089194 for 24/5 support. A total of 14 offices can be found on their contact page which each include their office address, telephone numbers and support email addresses. XTB provides two separate trading platforms that offer a conservative or innovative style of investing. 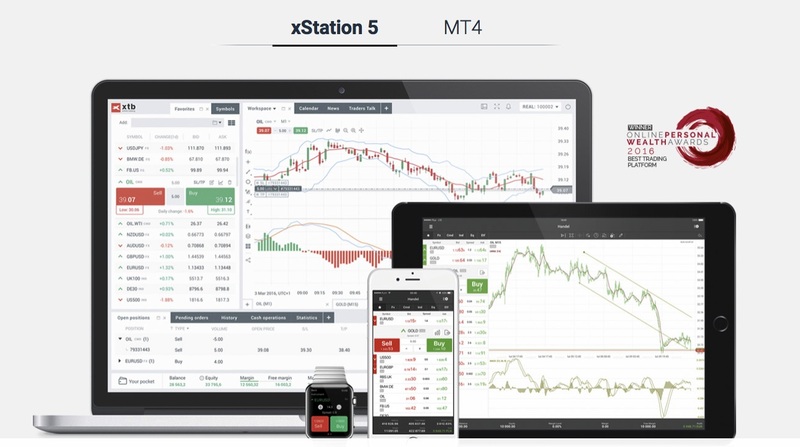 Originally powered by the MetaTrader4 (MT4) charting solution when this brokerage was solely operating with currency pairs, XTB innovated their platform by adding the xStation5 platform into their brokerage. This platform incorporation enables the ability of CFDs to be invested which has allowed this broker expand traditionally from currency pairs to a wide number of options. Engraved into the trading platform would be a number of common investment features such as investment calculators, advanced charting analysis, traders sentiment along with bulk order capabilities. The incorporation of technical indicators such as Fibonacci Retracement, Moving Averages, Relative Strength Index (RSI) and more are available while using their platform. Investors who prefer to invest forex can still benefit from using market orders, stop losses, take profits and are enabled to set up pending orders. Spreads vary between a value of 0.3 to 2.0 while depending on which instrument you decide to invest will determine your set leverage. Forex pairs possess a leverage of 1:200, commodities reflect a leverage up to 1:66, indices up to 1:133 while shares and ETFs leverage up to 1:10. XTB is a web-based platform so as long as you have internet connection with any wi-fi enabled device you can access the XTB platform. XTB has both Apple and Android apps along with SmartWatch capabilities. XTB accepts a number of payment methods such as bank wires, Visa and MasterCard credit/debit cards, Maestro, Skrill, Neteller, AstroPay along with several other e-Wallets. The minimum initial deposit required in order to create an account with this brokerage is $250 while any deposit made after that can be of any value. An uncommon but valuable feature about XTB would be how they run several in-house workshops. The subject of discussion varies slightly depending on their itinerary but overall these workshops appear to be a welcomed addition with this investment brokerage and offers something new to their investors. The address is: XTB, Level 34, One Canada Square, Canary Wharf, E14 5AA, London, United Kingdom. How can you trade cryptocurrencies? During the time of writing this review, xtb.com had a SimilarWeb global rank of 62,413. On average this brokerage has over 1 million monthly visitors indicating to us that this site is a popular investment destination. Most of the traffic that visits the site comes from users who reside within the following demographics: Poland (33.17%), France (11.56%), Slovakia (9.93%), Czech Republic (8.33%) and Spain (4.87%). Throughout this impartial review XTB has provided ample evidence as to why they are one of the most reputable online investment brokerages. Offering a regulated and secure trading platform while staying ahead of the curve by incorporating the xStation 5 platform has been testament enough that this brokerage is here to provide the best user-investment experience possible. For those of you who are still on the board about this brokerage, we encourage you to test out their Free Demo Account before committing to the XTB platform. If you found this review helpful, you might want to consider subscribing to our newsletter on the right-hand side in order to receive our future reviews directly to your inbox. Read other Bitcoin and Crypto Currency Day Trading Reviews. What are your thoughts about XTB? Feel free to comment below, especially if you’re trading with them or have attended one of their workshops.